Killer Characters: I Feel Like Dancing! It’s amazing. Glorious. Fantastic. Did I mention Amazing? I’m talking about vacation the week before Christmas. And you know why it’s so amazing? Because I work in a department store—the kind where customers destroy tables of sweaters so they can find that size Medium for their Aunt Sally, only to change their mind and decide on a necklace instead. My friend Eddie is the visual director for the store and he can’t get through a sentence without using five curse words. He shaves his head this time every year because otherwise he’d just pull his hair out. So how, you might be wondering, did I get vacation this time of year? That’s the other glorious part. I have a job at Tradava, but not in the store. I work in the advertising division on their magalog. (it’s a cross between a magazine and a catalog. Fashion people like to make up words.) While the rest of the store is focused on complimentary gift wrap on purchases over $25, I’ve been working on the spring/summer catalog, trying to predict what people will be wearing in May. Don’t tell anybody, but sometimes, when I’m not sure which trends are going to be hot, I rely on my trusty Magic 8-ball. In two days, my boyfriend, shoe designer Nick Taylor, is going to come home from Italy. I’ve known him for over a decade but most of that time was as business colleagues. This is our second attempt at a relationship and I have high hopes that we’ve worked out the kinks. He does travel six months out of the year, which makes it a lot easier to hide my junk food habit and tendency to stick my nose into police business. Hey, it happens. My friend Cat is eight months pregnant and I’m going to kick off my vacation with a girls’ night in at her house. Movies, popcorn, and the knowledge that I can sleep in as long as I want tomorrow…this holiday season has the makings of the best one EVER. 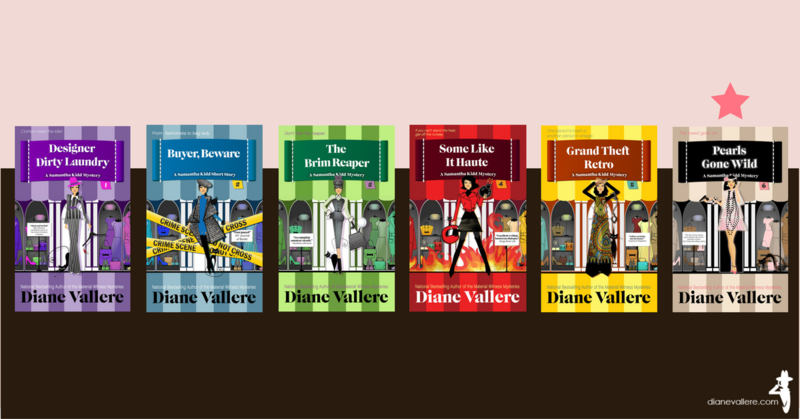 Season's Readings! 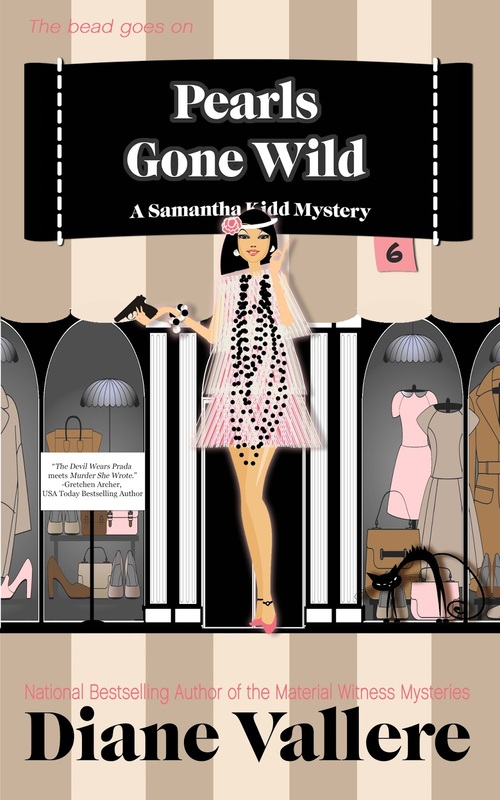 Comment below with your favorite holiday outfit and be entered to win a full ebook set of the Samantha Kidd mystery series: that's five books + book 6, Pearls Gone Wild, due out later this month! I think an ugly Christmas sweater will do for me. Any warm, comfy, colorful Christmas sweatshirt! a shirt or knit top, and flats. My days of wearing heels are long over. I'll have some jewelry and that's about it. Book sounds like fun - haven't read this series. I don't do holidays. Especially the ones where my kids (4) and grandkids (10) invade the house like a hoard of locust. In winter I live in sweaters and black jeans. In the summer I live in pastel colored short sleeve polo tops and either black jeans or khaki colored shorts. Leggings and a sweater. Socks instead of shoes. Comfort is the word. Favorite outfit? Jammies with a comfy bathrobe while opening presents. Current favorite holiday outfits not something Samantha would wear! T-shirts and sweatshirts with great-grandkids names and snowmen, reindeer, etc. on them. Retirement calls for casual clothes ;-). I have a couple Christmas sweatshirts that I just love---and they are so comfy. My favorite is a pair of skinny black pants and a long pink sweater, worn with black and brown flats. Cute, but comfortable.i like the sound of this series, thanks for the chance to win. I like jeans and a Christmas sweater. Christmas Red silk blouse with black velvet pants! I had a wonderful green empire dress. Jersey and lovely to wear. I loved that dress. Or maybe I should remember the blue velvet dress. Hmmm. I felt good in both of them. Comfy pants and a nice top. Something to relax in and enjoy dinner with family and friends. Merry Christmas! Burgandy red pants, black sheer tunic with beading. Thanks for a chance to win. I usually just wear black slacks with a red top. I have a Rudoph pin that was my grandmothers that I wear every Christmas and I have earrings that have red and green ornaments on them and they clang when I move my head. My husband one year got me a Christmas Pandora charm bracelet I also wear. Happy Holidays!! Sorry but have to say my favorite Christmas outfit would have to be comfy sweats or jeans and a nice comfy top. I would want to just be hanging with my family the whole season. Sleeveless top w/yellow orchids, black shorts, and rubber slippahs. Mele Kalikimaka! I love to wear lovely winter clothing to Christmas parties, but I often end up overheated! I always opt for some thin layers since I usually end up helping in the kitchen. I love to top that off with pretty makeup and jewelry. I enjoy digging out a lightup reindeer sweatshirt and my very nice "ugly" sweater. Not worn together. I'm on vacation now! With my current job I've started to take a week in early December off to get ready for the holidays. I don't have a favorite Christmas outfit. I have plenty of Christmas themed t-shirts and a few sweatshirts which I wear throughout the month. I used to dress us for Christmas, but not anymore. A black skirt and white blouse with a favorite Christmas sweater. I have a sleeveless mid-length black cocktail dress with seven different jackets and pashminas to make it fit any occasion! It is my go-to! Congrats, Doward, you're the winner! Dark green and black long sweater with black slacks. I hope you all are enjoying the holiday season. I usually just wear a pair of jeans and a big comfy sweater. Nothing special.